Skills acquired in an elective course and an entrepreneurial spirit help Wissam Sinno clinch a deal with U.S.-based company. Instructor Kim Issa with Wissam Sinno (center) and fellow students during “How to Build a Business Plan” class. Business student Wissam Sinno transformed the knowledge gained in class into a deal with a technology company giving him the rights to represent one of their products in Lebanon. 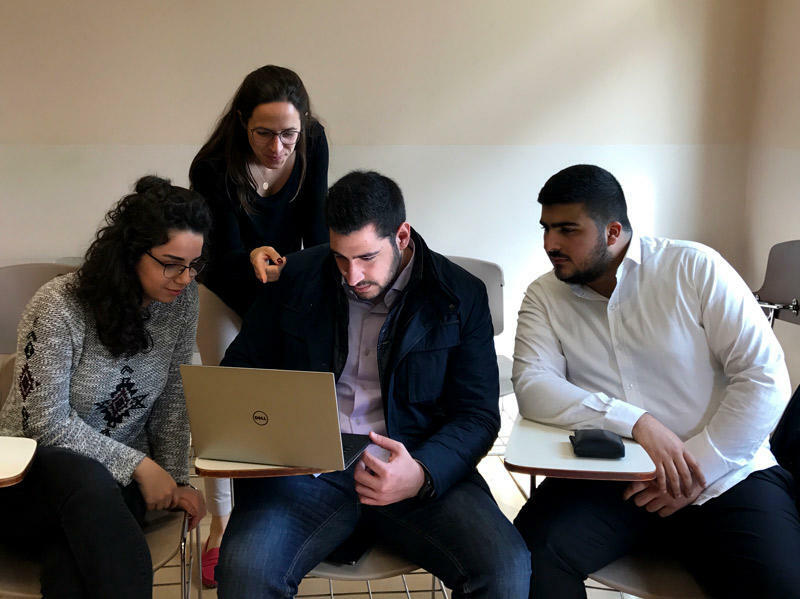 “A few weeks ago this student comes into my class with a little product, and says, ‘this is a gift for you,’ because he had just signed with this company,” says instructor Kim Issa who taught “How to Build a Business Plan,” a short, one-credit course offered as an elective by LAU’s Adnan Kassar School of Business (AKSOB). For Sinno, a senior majoring in international business, the course was an opportunity to realize a dream that he had had since childhood, that of starting his own successful business. “I used to sell stuff even when I was a kid,” he says. The course, organized around group work, taught students the steps to building a business plan for a product and writing a proposal. “The whole semester was about learning the process of starting a business,” recalls Sinno. “Wissam was the driving force in his group and, every week, he would share with me an idea for a product he wanted to import,” says Issa. The combination of the course contents and the student’s entrepreneurial spirit was soon to pay off. Even though the proposal the group wrote turned out not to be viable, Sinno used the skills he learned to land a client after the semester ended. “Two months ago,” Sinno says, “I lost my keys, and thought, there must be a way to find them.” He found a U.S.-based tech company that sold small devices linking keys to cell phones, and emailed them with a proposal to import the gadget to Lebanon. Initially, they rejected the idea, citing his lack of experience. “Then I told them that while I don’t have an agency, I did have a business plan, and sent them one based on another we had developed in class,” Sinno says. The rest was history: “I just told them how many units I wanted, and they shipped them to me,” he adds, proudly.